Chris Howard, Chairman of the Surrey Hills Society, is leading a walk on Wednesday evening, 16 April. The walk starts from the Percy Arms Pub, Chilworth- just opposite the Chilworth Railway Station at 6.30pm. The bluebell wood to be visited is somewhere on St Martha’s Hill and it’s in perfect condition for it to be seen at its best. 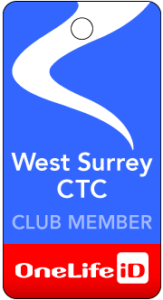 West Surrey CTC members are now all members of the Surrey Hills Society so now’s you chance to mingle and meet the boss. No doubt a swift one at the Percy Arms to round the walk off is on the cards too. Only sorry I can’t make it myself!